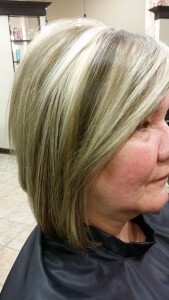 She has been with Kimberly at Indulge Salon, South for almost 30 years. She has super fine hair that just doesnt behave in the humidity, falls as soon as she walks out the door and has difficulty growing her hair out without it looking thin on the ends and see-through like a veil. Charmaine has always kept the look of a bob and was getting tired of this look. She was ready for something more…. 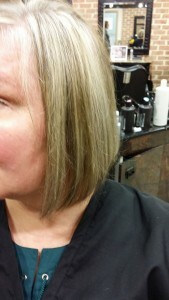 After a thorough consultation, she decided that she wanted more brown going through her hair vs the highlighted cool colors. I opted to low light her hair with a few packets of highlights on the top and then suggested tape-in hair extensions to give her hair thickness that will protect her ends as they grow out and to give her color that won’t fade. She was thrilled. Look at the AFTER for the best result. 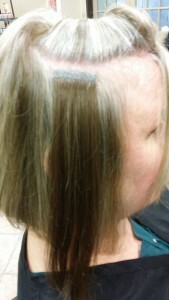 the tape-in gave thickness in the front of the hair that everyone could see, the back stayed the same. These were great for trying and seeing how she did with more hair in the front. All she needed were 4 packets to give a totally different approach without having to do the whole head or the expense. We discussed the AFTER care learning how to brush and comb her hair and when to tie it up at night.